The very prickly Bull Thistle (Cirsium vulgare) can be found along roads, and in fields and disturbed areas such as logging slashes. I found this specimen on a logging road near Chippewa Bay on Powell Lake. Bull Thistle is an invasive species introduced from Euroasia. It's considered a noxious weed because it can spread easily in fields, keeping stock from grazing, and can contaminate hay. Bull Thistle is a member of the Aster Family. It's widely distributed throughout Canada and the United States. It's a biennial plant (taking two years before going to seed) that can grow up to two metres tall. Rigid upright stems have spine tipped leaves. Thistle heads are surrounded by spines and sport bright pink to purple flowers. Never Fly Over an Eagle's Nest (Oolichan Books, 1980) Joe Garner memoir and the story of his family from the early 1900s to the late 1950s. Joe's mother and father fled the Ku Klux Klan in South Carolina, headed to San Francisco by train, and took a steamship to Vancouver, BC. Oland Garner, Joe's dad, heard about the "land of mild and honey" from his father. It sounded immensely better than death back home. Vancouver didn't work out, so the Southern couple went by ship to the growing city of Victoria on Vancouver Island and Oland got a construction job on the new elegant Empress Hotel. 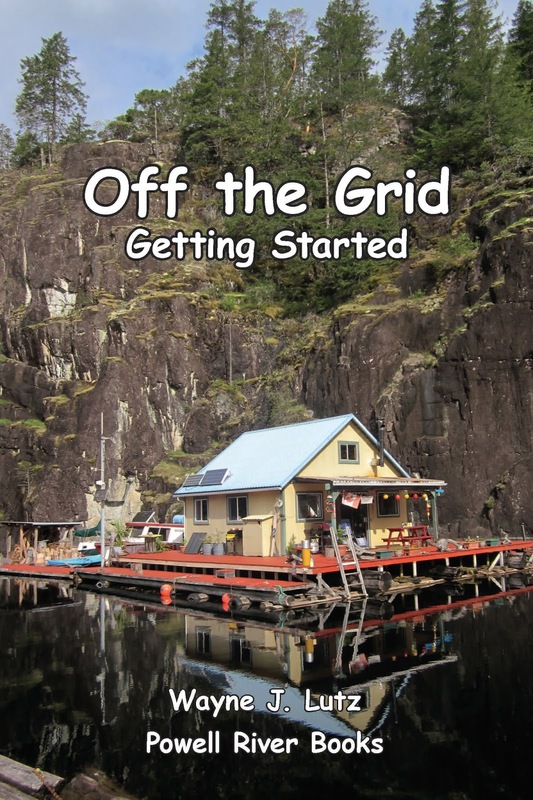 Friends on the job invited Oland and Lona to visit their home on nearby Salt Spring Island. Shortly thereafter, the couple with their young daughter Ethel moved to a place they would call home for many years. The book follows the lives of Oland, Lona and their ten children (nine to be born on Salt Spring Island). Several chapters were written from Joe's brothers' and sisters' point of view. Pioneering life wasn't easy in a rented log cabin, the farm they built, or the house in Ganges. Joe was born in 1909, the third child in the large family. Much of the book revolves around the strong partnership between Joe and his slightly older brother Tom. 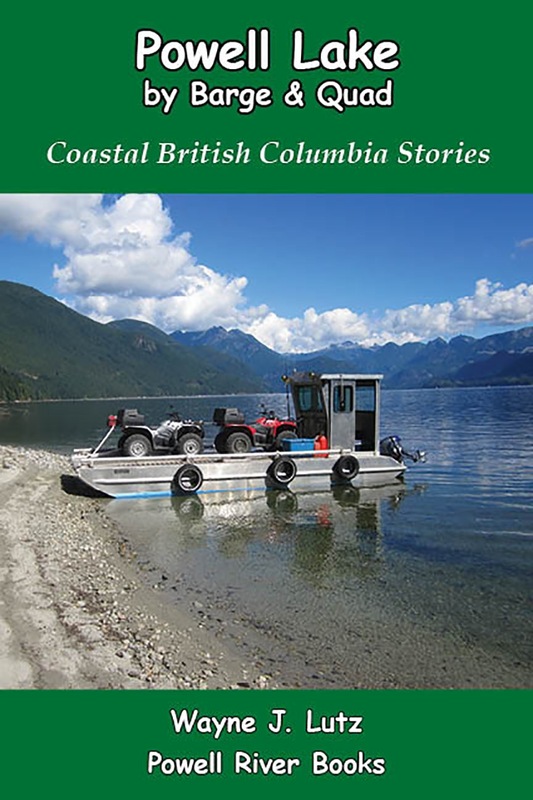 Logging, fishing, hunting and construction projects took the family members throughout the province and beyond. Joe was a contemporary of my mom and dad, but their experiences were drastically different. Growing up on a truck farm in rural Compton near Los Angeles, my mom didn't have any difficulty in going to school, or with child labour experiences (even though she always said she wished she had a nickle for ear of corn she packed for market). 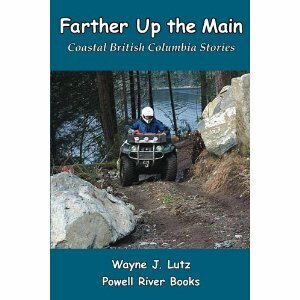 One thing I liked about the book was hearing again about other early Coastal and Northern BC residents. Lona was a distant relative of Ralph Edwards whose homesteading experience on Lonesome Lake was chronicled in Ralph Edwards of Lonesome Lake and several other books. Also mentioned was Jim Stanton, who with his wife Lauretta, homesteaded at the head of remote Knight Inlet. Their lives were the basis for Grizzlies in Their Backyard. 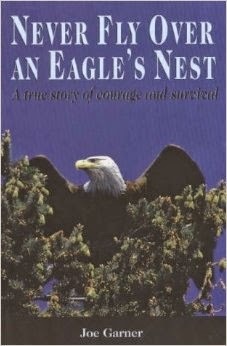 And why should you "never fly over an eagle's nest?" You'll just have to read the book for yourself to find out the answer to that mystery. We have an unusual plant on our cliff, it's called Stonecrop. It's unusual because it's a succulent that you would expect to find in a drier climate, but it seems to thrive on the sunny face of our cliff. 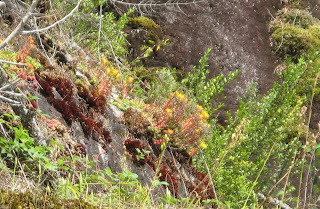 Surprisingly, in Coastal British Columbia, you can find it clinging to the ground on rocky, exposed outcrops. I believe ours is Sedum spatulifolium. The leaves are fleshy and sage-green to reddish. In summer, they develop bright yellow flowers on tall stems. Historically, the Coastal Salish people used Stonecrop leaves as a styptic poultice. When we got to our cabin this trip, we had a big surprise. Instead of the clear blue water we're used to, it was murky and green. Seeing down below a foot or two was impossible. We've kept records about lots of things over the years: critter observations, gardening, events in nature, the weather. Here's what we figure. October 2014 was the rainiest October in our records. After a long, dry summer, the creek beds collected a lot of silt and debris. When the first winter rains made them run, all that gunk was washed down into the lake. More than ever before. Because Powell Lake is so large (and deep), it has taken the suspended silt particles from the major waterfalls at the head of the lake this long to reach us down at Hole in the Wall. No matter which way you look, it's murky and green, and has remained that way for over a week. If you go north it's the same. If you go south towards the mouth, the murkiness clears up on the surface, but the lake is still has a greenish cast. I'm not sure what is causing that part of the phenomenon, maybe tree reflections, but it's pervasive from shore to shore. Quite the mystery. If you have any suggestions I would love to hear them. This is a first for us in thirteen years. Makes me feel like I'm in the south living on a bayou. This week we went out for an afternoon of quad riding on Goat Island. On the way home, we got some nice sunset views. We love our cabin's location, but because of the surrounding mountains and trees our sunset views are limited. Lichen is made up of a combination of organisms. All lichens include a fungus plus an algae and/or a photosynthesizing bacteria in a symbiotic relationship. 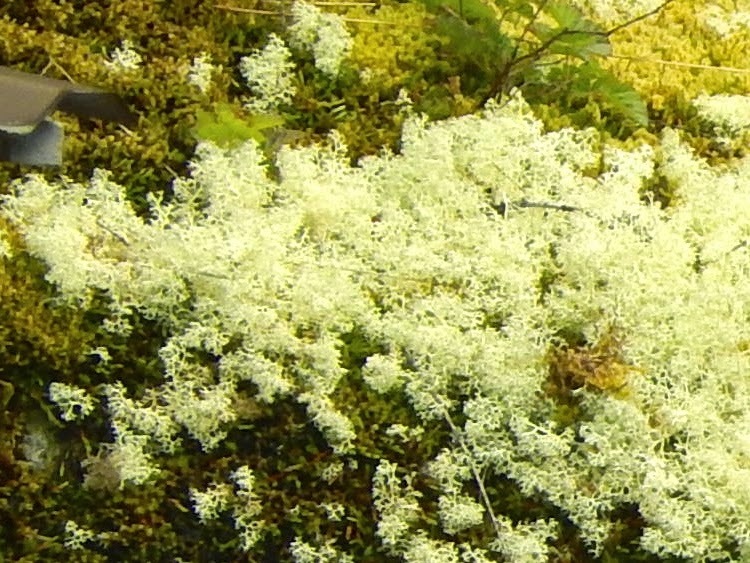 Lichens are plant like, but not technically plants. Lichens cling to plants, rocks, logs or soil, but they are not parasitic. Because of their unique nature, they create their own food from sunlight, air, water and minerals. 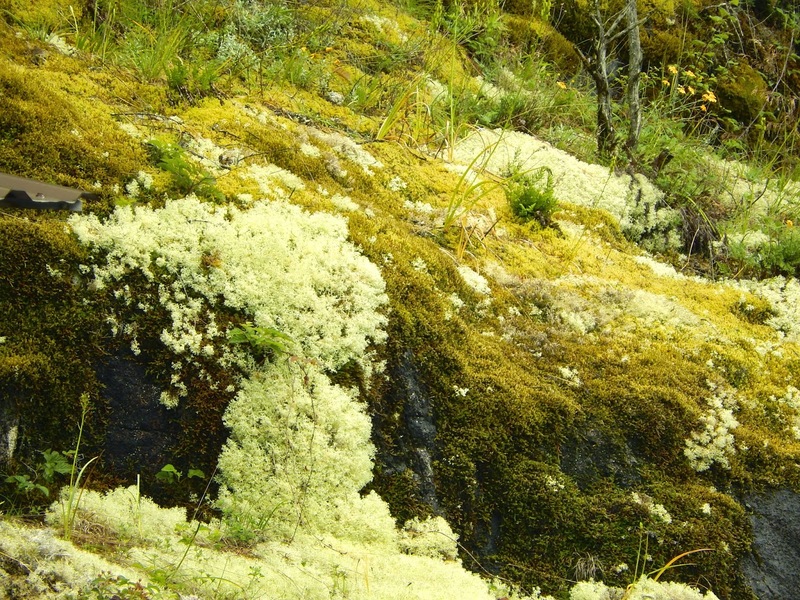 A common form of lichen in Coastal BC is Reindeer Lichen. There are many different varieties ranging in size and colour. The Reindeer Lichen on our granite cliff if off-white, erect and forms flowing mats, especially at this time of year. I'm not sure which variety I have, but I think it might be Cladonia rangiferina. Last week I shared about how a mechanical harvester has revolutionized forestry. At the same Western Forest Products tour, they demonstrated how helicopters help protect the forest from wind damage. Trimming and topping isolated trees and trees at the edge of a cut block helps prevent blowdowns during strong winter storms. Western Forest Products contracts with Oceanview Helicopters in Powell River to mechanically trim and top trees in danger of damage. I fly an airplane and know how dangerous down drafts can be. I can't imaging flying at tree level with a heavy cutter hanging below. An accidental snag could really ruin your day. But these guys are brave and careful. They have to be. 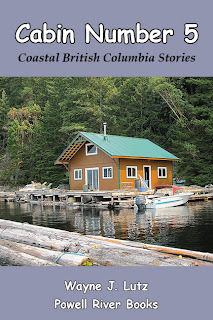 Last month I reviewed Drawn to Sea by Yvonne Maximchuk. This month I read a book she co-authored with Bill (Billy) Proctor, an upcoast living legend. 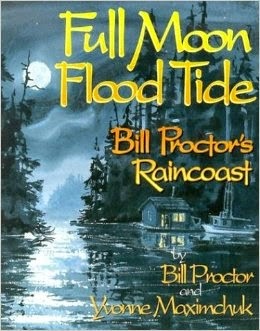 Full Moon, Flood Tide (Harbour Publishing, 2003) was written first, but I’m glad I read them in reverse order. 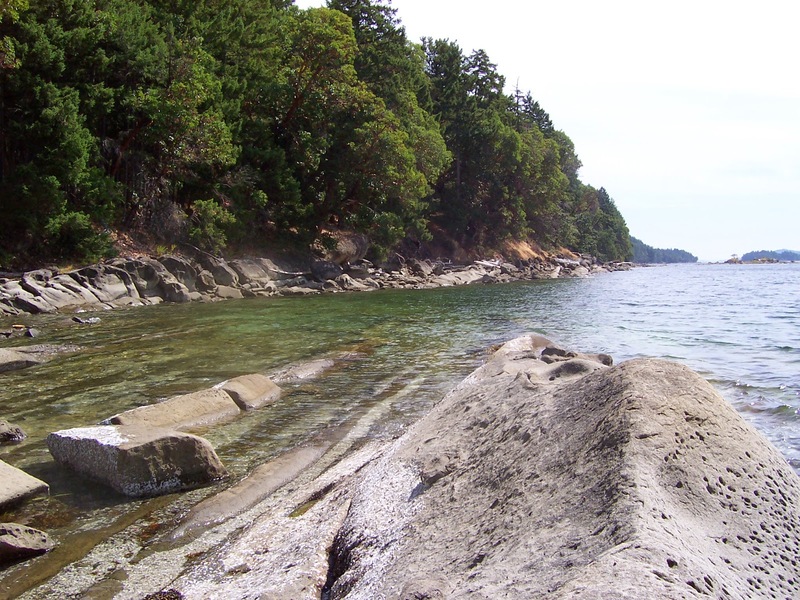 Yvonne came to live near Bill in Echo Bay on Gilford Island between Vancouver Island and the BC mainland. In addition to her own experiences, Yvonne wrote about Billy Proctor because of his major influence on this remote Coastal BC island. Her story helped prepare me for the history Billy recounts in his book. It’s amazing how much Billy remembers about First Nations villages, and oldtimers who eked out a living by hunting, fishing, and logging in this remote location. In his opening, Billy says, “These stories are about the past that is all but forgotten, and about a special breed of people who came to this part of the coast and helped pave the way for new generations.” I'm one of the new generation, and appreciate knowing all that has gone before. The book is organized by inlet and island groups. Maps, old photos, and pictures by Yvonne (an accomplished artist) bring the story to life. First Nations villages, logging camps, fishing spots and canneries, and settler cabins are pinpointed. A coastal cruiser could use the information to find these places steeped in history. But care needs to be taken, weather and the harsh environment make this a dangerous place for the unwary. I especially enjoyed detailed descriptions of 1900s logging techniques, fishing for the mighty salmon, homesteaders lives, and the life cycle of a pink salmon from fry to fertilizer. I didn’t realize that much was known about their life at sea. The phrase “full moon, flood tide” has a special meaning to Billy and the rugged individuals past and present who make BC’s north coast and islands their home. I’ll let you read the saga and discover its special importance for yourself. 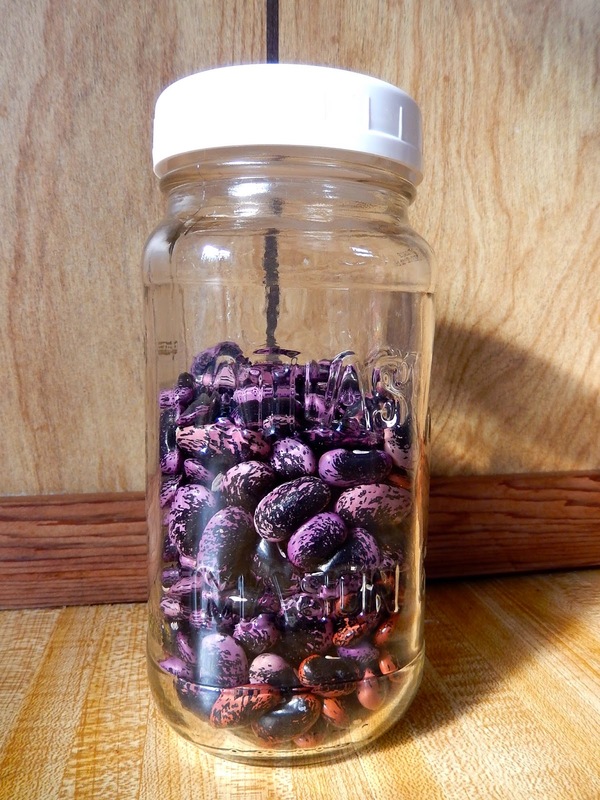 At the end of the season, I let the last of my Scarlet Runner Beans "go to seed." One year I saved the seeds to plant the following spring, but all I got was plant, no beans. This year I saved what was left of my beans to dry for cooking. Scarlet Runner Beans make very large pods if you let them go. Inside, the seeds really increase in size and plump out. 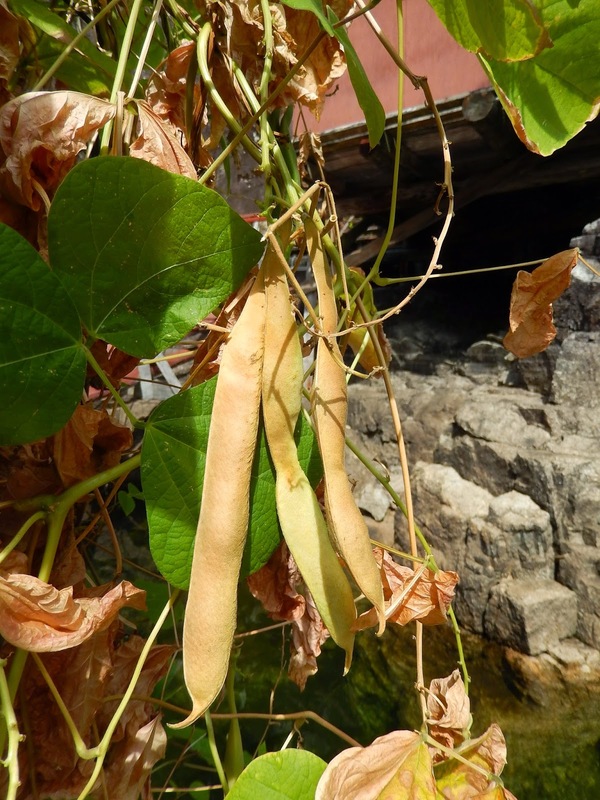 Before cutting down my bean plants (I grow mine in a cut down 55-gallon plastic barrel), I removed the dried bean pods. Having dried on the vine, the pods are easy to pop open to remove the partially dried seeds from inside. To make sure that the beans are completely dry before storing, I leave them in a pan and place them near a window where the warm fall sunshine will complete the drying process. When Western Forest Products gave us a forestry tour, they included a demonstration of how a CAT Harvester can harvest, limb, cut to length, and stack logs in one fell swoop. It's an amazing machine that has revolutionized the industry. One person in a computerized cab can make the massive machine run through its tricks in no time. I've tried saving Geraniums twice before. The first outdoor attempt was marginally successful. The roots and lower stems of two plants remained alive and regrew foliage and flowers the following summer. My second outdoor attempt was a total failure. This winter I tried an indoor method. Because the cabin temperature can drop below freezing if we leave for an extended period, I'm cheating and leaving the plants in the condo in town. I'm trying the dormancy method. Wait until the soil is fairly dry, then carefully remove the Geranium plant. Brush off as much dirt as possible, but do not wash the roots. Pinch off any flowers, flower buds, or dead leaves. Wrap the remaining stems and foliage to keep the light out. The video used paper bags, I used newspaper lightly tied with the roots exposed. Soak the roots in water for an hour before hanging upside down. Each month, soak the roots again for one hour and rehang. I chose to place my Geraniums upside down in a plastic tub in the condo guest bathroom tub that never gets used. The leaves will die, but the roots and lower stems should remain viable to regrow in the spring. Here's a video by TheWeekendgardner on YouTube that helped me. Here are my results. I lost two of the smaller plants. In early March, I put the rest into containers with lots of water to rehydrate. Then Wayne and I left for a three week sun-cation in Arizona.